We were expecting it, it was just a question of time. And the way they denigrated us was based on the same two set of rules they always use by applauding non-white in-group preference whilst at the same time criminalizing white in-group preference. ‘Urges’, as if it striving for stable relationsships and creating healthy families is a completely unnatural thing to do. This article picks up on a tweet lamenting that in 2018, whites still do not applaud their orchestrated extinction. How impertinent of them! 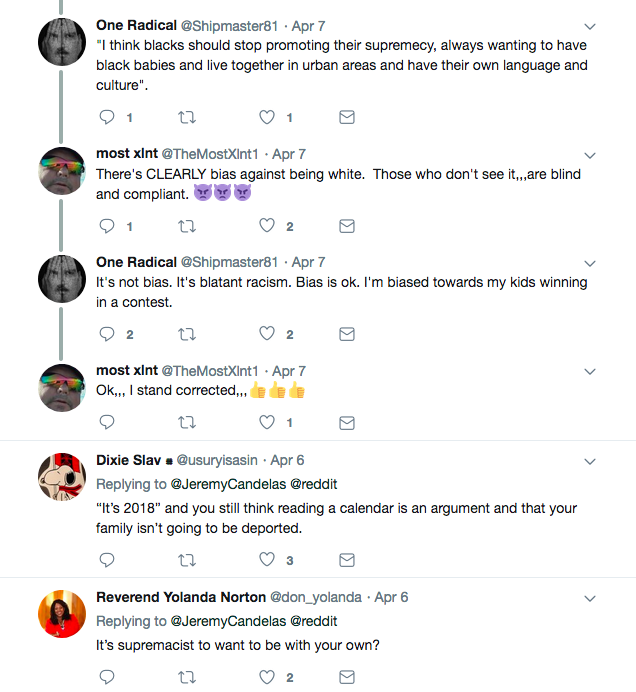 Is it a lack of IQ or the blatant chutzpah that make them believe (or hope) that people would not see the anti-white bias behind these slurs? 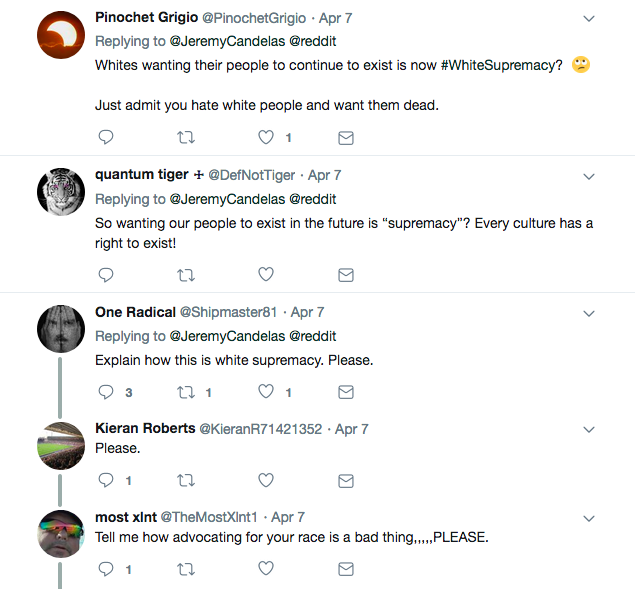 Calling for white extinction is fine, but whites who simply wish to create healthy families by following traditional values are extremists, nazis, monsters and last but not least ‘White Supremacists’. If you are looking for the perfect example of describing the term ‘double standard’, here it is. 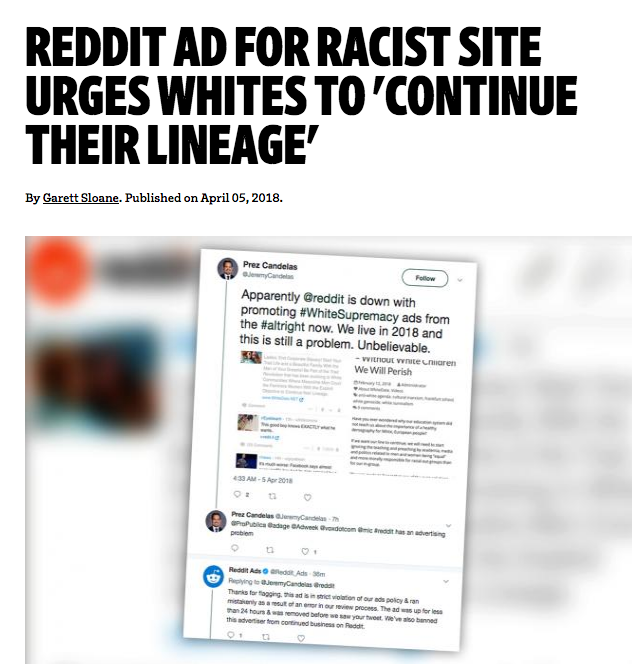 By banning White Date from advertisement, Reddit joins the anti-white social-media league of Facebook, Twitter and Google who have respectively blocked all our campaigns whilst never having delivered any reason for this blatant anti-white discrimination. 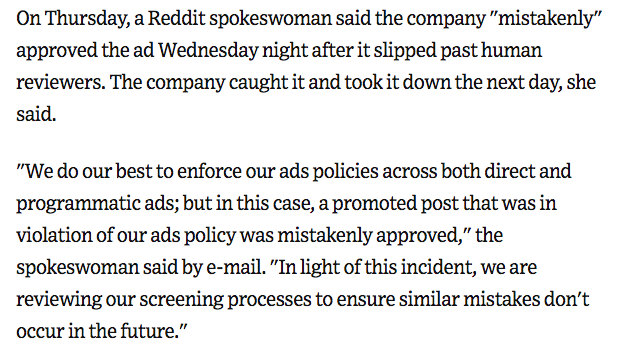 I remember last year the Facebook ad taking off like a rocket leading to 10 sign ups within only a few hours by simply targeting Trump supporters. Then Facebook shut it down, and six months later a new civic nationalistic dating site appeared called ‘Trump Singles’ targeting Trump voters of all ethnicities and races. Coincidence? Or a desperate attempt to lure whites onto a side track and away from the growing desire for white ethnodating, embracing the idea of founding families with sub-Saharan Trump supporters who love the American constitution, and who also believe that these kind of alliances will bring the European spirit to a new level of wisdom and productivity. Woke readers pointing out the complete lack of logic and the insufferable double standard. 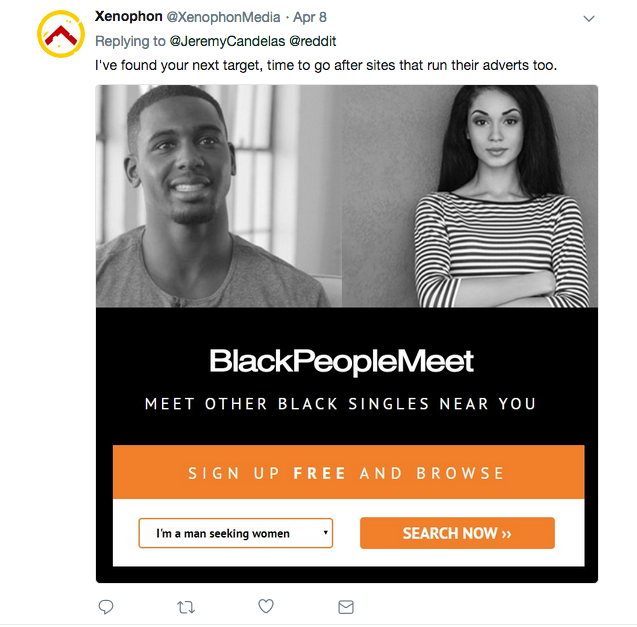 When have they ever attacked non-white ethno-dating sites for Blacks, Indians, Koreans, Latinos, Japanese, Turks, Jews and Arabs? Obviously anti-whites never offer facts to their accusations. Rolling their eyes seems to be the only argument they have got, deeming facts to be racist. 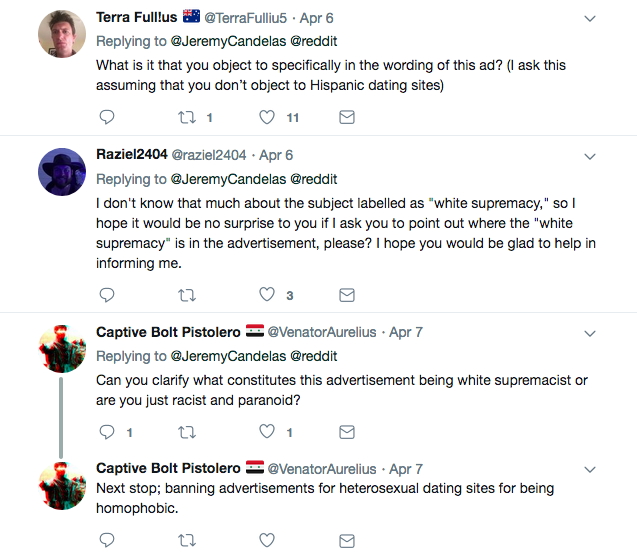 Anti-white racism exists, and even non-whites are starting to name it. Strict violation of which exact policy please? 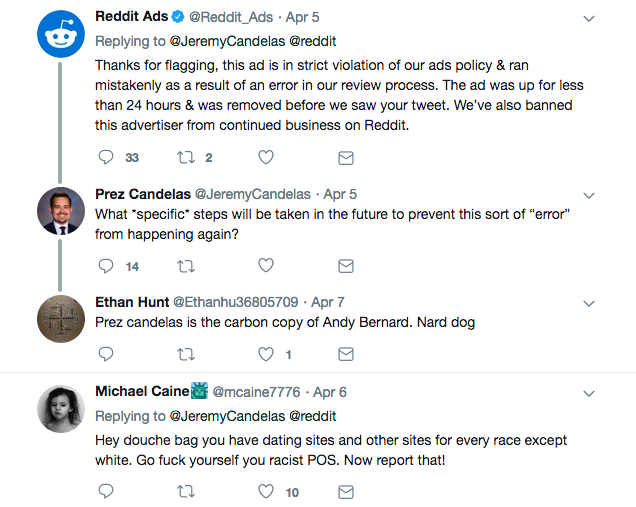 And if this Jeremy Candelaz is real (which I doubt), he has an undefinable Mestizo-Asian ethnicity thus probably has no feeling of belonging to a distinct folk. Maybe it’s a kind of psychological emptiness that leads some mixed-race people to envy people with clear ethnicities and wish for their destruction? We can only speculate. Please fine below two excerpts from this piece revealing the fine craft of how to vilify something completely normal. Does this Reddit ‘spokeswoman’ have a name or doesn’t she dare to reveal it whilst supporting White Genocide by denying whites to practice in-group preference? Just you know, for whites wanting their folks to continue to exist is ‘racially charged’ and as violent as slapping non-whites. Do we need any more proof of the fact that if we let them, they will take away our mere right to exist?